1. General Purpose - This is typically a microfiber towel (16" by 16") with a standard split weave and an 80/20 blend of polyester and polyamide. The towel has no specific purpose, and will be equally adept wiping paint, glass, vinyl, plastic and leather. This towel will have a medium thickness (plushness) nap. An 80/20 blend of polyester and polyamide, this is an all purpose detailing towel with a short terry nap on one side and a medium plush-ness nap on the other side. The towel can be used for cleaning, polishing and quick detailing. 2. Glass & Polishing - Microfiber towels that work well for polishing and glass cleaning seem to have the same basic characteristics. First, a glass cleaning towel should be 100% lint free. In most cases, this means the weave is going to have a shorter nap than a general purpose towel. Many people believe that a good glass towel will leave as little water as possible so the droplets will evaporate without leaving a spot. A good glass towel needs scrubbing power to successfully remove the residues that cause streaking. It's the same characteristic that makes a good polishing cloth. 3. Drying - My favorite drying towel material is the Piqu� fabric that mimics a waffle pattern, known as microfiber waffle weave towels. It has the ability to wick up water like nothing else I've found or tested. It's best to find a fabric that's not too heavy, or you won't be able to wring it out when it gets saturated. Microfiber waffle weave drying towels come in a variety of sizes. The highest quality drying towels offer satin bound edging. 5. Final Buffing - Cobra makes a series of extremely soft, plush microfiber towels with a higher fabic weight than you find in general purpose or drying towels. 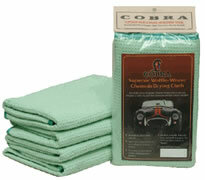 The Cobra Deluxe Jr. 600 Microfiber Towel has a nice bound and stitched border for scratchless use. It weighs 600 g/m� and is made of a 70/30 blend of polyester and polyamide. Using microfiber towels is pretty simple. For cleaning, you simply wet, wring and wipe. For drying you wipe, wring and wipe. How much easier could it be? Of course, there�s a lot more to detailing than just cleaning. One of the most common uses of the microfiber towel is quick detailing. If you�re not familiar, quick detailing is a light cleaning to remove dust, finger prints, water spots and other minor contamination. Microfiber towels make quick detailing a snap. Simply mist your car with a quick detailing spray and wipe. There is a catch. When using microfiber towels, it�s best to wipe in a single direction until all visible dust and contamination is removed, flipping the towel frequently. A good microfiber cannot unload particles without being immersed in water. If you wipe back and forth while quick detailing, you will be rubbing the dirt you pick up back and forth over the paint. When using microfiber detailing towels to remove polish or wax, wipe in a back and forth motion, not in circles. Most microfiber polishing towels perform better this way. When used in a circular motion, the fibers will unload some of the product previously picked up. Flip and refold the towel frequently to maintain a fresh side. When the polish or wax begins to smear, it�s time to get a fresh towel. Wash in cold water only. Warm water can be tolerated, but hot water cannot. Polyester and polyamide both shrink in hot water. If you wash in hot water the fibers will shrink and the towel will not perform as intended. Do not use fabric softeners of any kind. The softener will become lodged in the microfiber reducing its ability to absorb water, clean and pick up dirt. In short, you�ll have a soft towel that�s useless. Do not dry above medium heat. Treat microfiber towels the same as you would your delicate clothing. Drying with high heat is worse that washing in hot water. To make microfiber care simple, BLACKFIRE developed a single detergent that thoroughly cleans microfiber and helps maintain its texture. BLACKFIRE Microfiber Cleaner & Restorer is the only microfiber detergent you need to remove oily and greasy residues in the wash.